THE TRUMPETS WERE BLARING and the photo opportunities taken of the actors supposedly behind the actualization of a 30-year old dream: an international airport in Panglao, Bohol in November. No, there is nothing wrong, at all, with owning an international airport given the actual and potential beckonings of the tourism industry of the fabled island of Bohol. Globalization is upon us- that means nations, companies and people are in an integrating mood. As the ASEAN slowly solidifies its integration apparatus, nations need to be able to travel direct not just to the nation’s capital but to other provinces as well. An international airport enables people from other countries to fly direct to our shores without them having to face the horribly indescribable traffic in Manila and even Cebu. 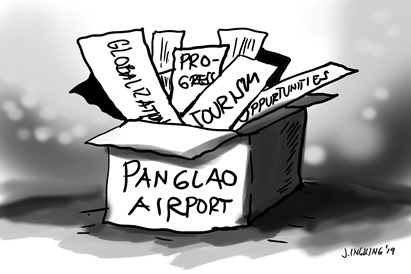 Foreign corporations are better enthused to study the business prospects in our island province because of the convenience of a direct landing on our shores. In short, an international airport is an important adjunct to our speedy development – a basic infrastructure to hasten economic activities related to trade and tourism. Trade in the sense that air cargo services will be direct and convenient to both importers and exporters of goods to Bohol and translates to cost savings and economies of scale. It is definitely good for business and eventually to many people and Bohol. After 2010- there were 1,200 international airports around the world – responsible for carrying 2 billion of the world’s populace to their places of destination and carrying 50 million metric tons of cargo worldwide. The new Bohol Panglao International Airport would be our ticket to enter into that global equation. Definitely, its erection of such a haven for global travel places the province among the highest pedestals of the top tourist destinations in the country. However, because of its international stature as an airport, much is expected. But somehow- in this initial stage of operation, people are already questioning whether it might have been better if we had a modern domestic airport but in international standard instead rather than of the other way around. Why is that? Is the international airport not up to its billing as such? The public noticed some deplorable things at the airport. Among them, the sporadic stoppage of the brand new escalators which definitely creates a bad impression to tired arriving passengers who are mostly aware they are landing on a brand new international airport. Another negative comment in the airport is the absence of food concessionaires where passengers can get refreshments or meals or other pleasant services such as a massage nook or a business center. Look around the airport and notice that there is an obvious lack of garbage receptacles in and out the terminal, something that is basic for the cleanliness and sanitation of the terminal. What the public is apprehensive is that given these- it could lead to the the fast deterioration of whatever is equipping the BPIA supposedly into a “state of the art”when the government completed it at no small cost of some P9 billion. It appears that the main reason for this is the continued holdover management of the Civil Aviation Authority of the Philippines (CAAP) of the new airport. It has yet to be turned over yet to the private sector which is the Aboitiz Group. In certain industries, government is not the best sector to run such industries that are better served by private firms. We certainly would be pleased to hear from Boholano NEDA Sec. Ernesto Pernia regarding the timeline on the turnover from CAAP to the Aboitiz Group, bruited to have won the bidding for the terminal operation. Because the CAAP is a “Phantom Manager” whom one cannot see. There is no shadow of any CAAP officer on deck to voice any complaint. Gee, the airport “manager” is even Cebu-based. One cannot manage what one cannot see and experience. At times, the public complained about non-coordination of flight schedules such that the simultaneous arrival of three airplanes naturally resulted in the congestion at the terminal arrival section. Some PAL passengers had to bear waiting inside their plane due to this situation. Truly- a hands-on airport manager with authority is badly needed at the BPIA. So, therefore, the public is asking why it has not been made privy soon enough about the definite date when the anticipated turnover to the private group would happen . Or as some people are bitching – was the airport hurriedly inaugurated while the bidding procedure to the private sector was still far from being finalized in order for some people to gain political “pogi” points? This accusation may not necessarily be true. But the fact remains that the air riding public is being prejudiced and our international and national image gets a black eye. Certainly, we hope this Editorial reaches the office of the dynamic Department of Transportation head Art Tugade who was spewing superlatives about the airport before the president when the BPIA was inaugurated. Of course, we were told in school not to judge a book by its cover or its modern version of not judging a country by its airport. But as we grew up and matured- we were told that “first impressions last”. That is why when we are to meet someone new for a business deal or for a job interview- we have to put our best foot forward because we know first impressions last. We arrive on time, are well groomed and wear the best clothes. The reverse impression is what our guests get when they savor our so-called state of the art international airport today in its imperfect conditionalities. And remember that when people are pissed- people talk. That seems not the end of woes. Once out of the airport, there is a visible lack of convenient means of land transfer from the airport to the city and to the resorts. We were just too glad to hear that Ceres Liner of Bacolod fielded air-conditioned buses to serve the airport route. However, our land transport mode needs a much better system in order to give convenient and fast travel to the passengers. What is making it worse is that the airport route buses also carry goods of local residents which make the ambiance inside the bus less than being an ideal tourist friendly bus, We suggest that bus management will designate an “express” system with buses intended exclusively for airport passengers and have designated stops rather than randomly pick up and drop passengers anywhere along the route from the city to the airport (vice versa). Of course, we are aware that the general riding public need not also be deprived of their services by providing their other units to them to and from Panglao. Because of the above this is the second time that this Editorial is seeking for like-minded folks to band together and study the need to have a Panglao Integrated Development Authority Because we are no longer running a “sari-sari” store out there in Panglao. 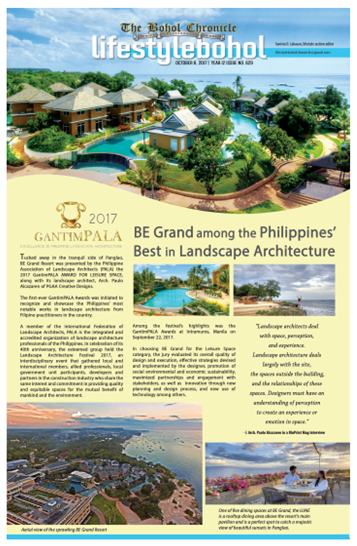 It is a receptacle of 2 million visitors every year (potentially) all jaded by constant travel and will demand that Bohol is up to its rising expectations bannered by a new international airport. Of late, we even heard in places like Panglao that they have a Beach Development Authority- independent from vested interests of LGU officials and resort and restaurant owners- who will make rules to make our beaches perennially healthy. Such an authority would not have allowed the deplorable state that the DENR Secretary Roy Cimatu had found to his chagrin when last he checked our Panglao beaches. With the international airport, we have just elevated ourselves to world-class reckoning. We should rise you to meet it and not hide our heads underneath the sand, like brainless ostriches.